In great spirits after advancing to the finals of the OSNY competition and spending a lovely night and sunny Brooklyn morning with my sibs, I was proud to be through security at LaGuardia early, and happily humming as I wandered the terminal in search of a healthy snack. To my delight I stumbled upon a food court that included a salad bar and a coffee shop that sold smoothies made of actual fruit. 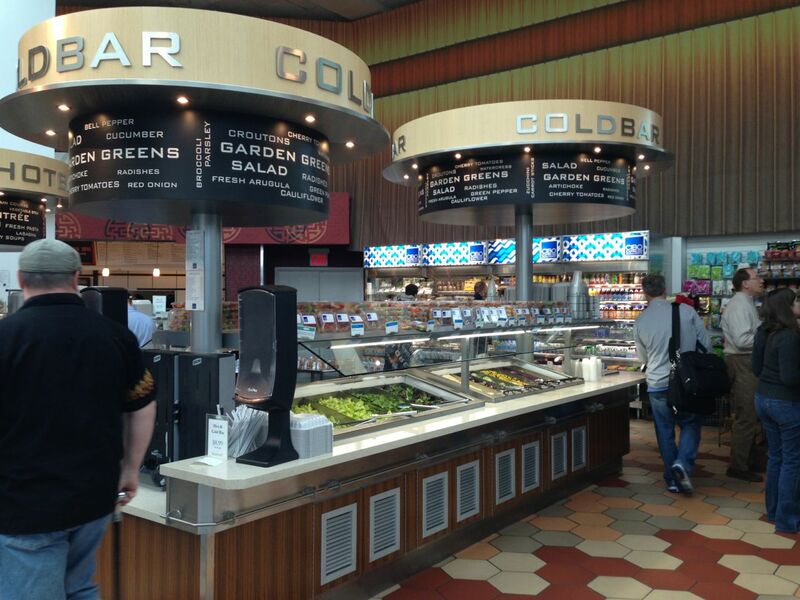 I thought, “a salad bar in an airport! What a nutritionally advanced and wonderful idea!” I was feeling a fruit deficiency though, so I opted for a coffee shop smoothie that featured strawberries, blueberries, apples, lime juice and ginger. 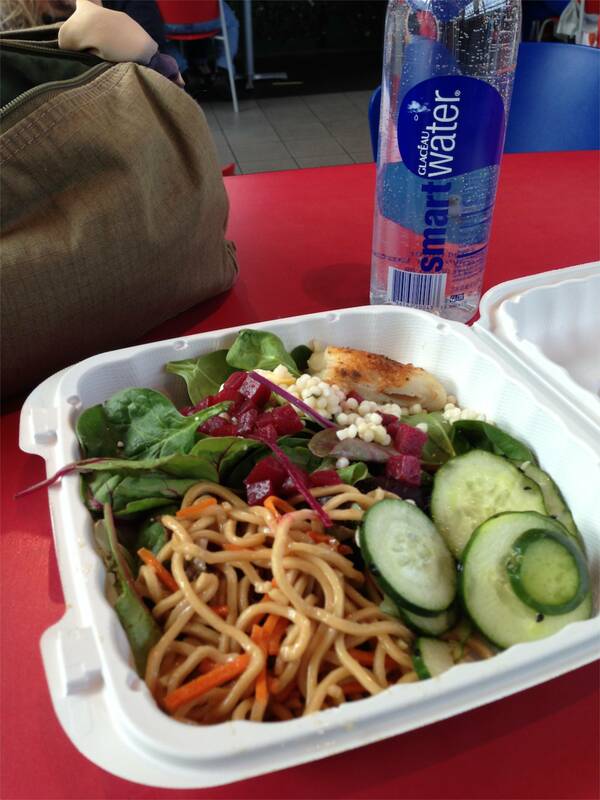 It was quite tasty, and I felt virtuous as I sipped, wheeling my luggage around the food court and spontaneously taking a photo of the salad bar for my first blog posting. Now, here is one thing you must learn about me: I break things. Often. It comes from a combination of poor spatial relations abilities and a tendency to get rushed and stop paying attention to what I’m doing. Recently I’ve broken a rental car, a tea kettle and stovetop burner, and our newly painted kitchen accent wall at home. After that last incident (suitcase-related), I promised my husband I would reform. I’ve been doing a lot better. Until yesterday when I took an iPhone photo while holding a smoothie, a suitcase, and a purse. As you might imagine, splat!!! went the smoothie just as I snapped my quite excellent salad bar photo (see above). Oh, the wasted nutrition! I try as much as possible not to buy food in plastic containers, so it’s an extra travesty when your plastic smoothie cup ends up in the landfill and you didn’t even get to enjoy more than two sips of the smoothie it contained. Two separate travelers stopped to bring me napkins and even briefly helped me wipe up fruity goo whose trajectory was six or seven feet in diameter. They were so calm and nice about it! In an airport, in New York! I started to laugh at myself as I furiously swept at the spreading pool of pink, and by the time I’d used most of the paper napkins in the food court to control the damage, an employee came by with a Wet Floor sign and told me someone with better equipment would be along to finish. I apologized; she smiled and said, “everyone drops things.” I told her that I do it more than the average person and she laughed. 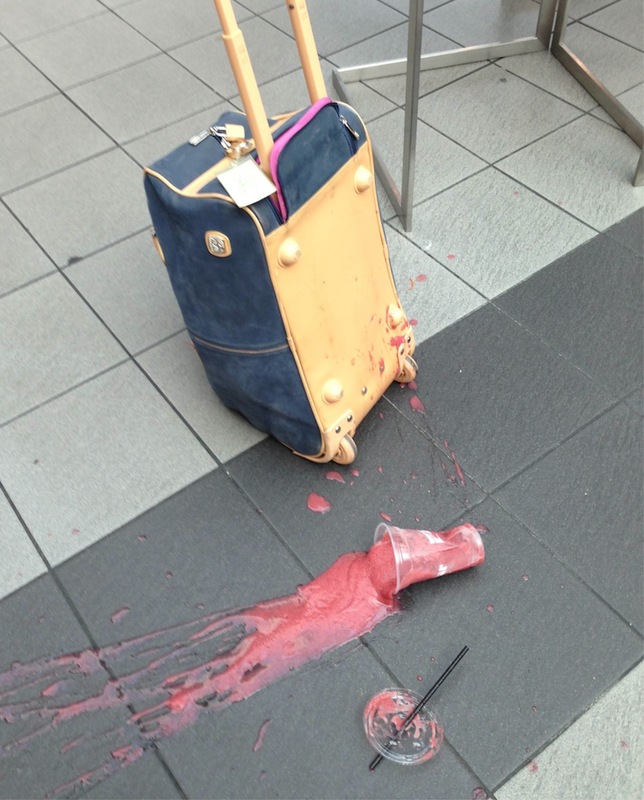 And that was the end of the LaGuardia smoothie incident. Not such a tragedy, except for the loss of a tasty, healthy beverage. The debacle certainly filled up my wait time (I also had to make a dash into the ladies room to wipe off my luggage), and kept me from getting bored. I was, of course, still hungry and woefully behind on my 5 A Day of fruits and veggies. But I decided that maybe the smoothie experience was not meant to be. I went to the salad bar instead. Yum.